Desert Valley League Finals - Indio's Boys / La Quinta's Girls Rock! Every year, we expect to see a boy or two break out of his shell and improve by a minute in becoming one of the best in Riverside County. But, this year - we witnessed something unlike we previously had. Hard to believe that originally, this young man came out for Cross Country to get in shape for basketball and baseball. Well, he dipped below the 17 minute barrier that same freshman season giving us a glimpse of his talent. Working his way into a 9:34 3200 meter athlete this past Spring, he was still unable to qualify from his league in the 3200 to the postseason. Talent still evident for sure but the greatness he was about to unleash over the next six months came as a shock! Our 2009 Boys' Athlete of the Year is junior Lane Werley of Martin Luther King High. He truly put his name out there on the statewide scene in almost beating highly touted Elias Geydon of Loyola down at the Mt. Carmel Invite. In October, Mr. Werley then roared to a new county record of 15:04 for the Woodward Park course up in Fresno! Making the postseason was no longer an issue as Lane was now up there with some of the best in the nation! Committing and believing on a much higher level is what took Lane from being a 16:00 athlete in 2008 to a 15:00 one in 2009. Waking up at 4 am to get online to watch a live marathon is one example is how Lane simply 'woke up' and tapped into his true talent! When it was said and done, he just missed the county record for the Mt. SAC course but becomes the first to break 15:00 two separate times while romping his way through the Big VIII League and an individual league title. He was able to lead his ML King boys to their greatest season in school history, shattering previous school records. Not initially known for his kick, Lane was able to outlast a 4:08 1600m athlete at the Southern Section CIF Finals and finish 2nd place. In a well measured effort, Lane than moved up from 7th to 3rd over the last 3/4 of a mile at the California State Meet to finish 3rd. For that race, he became the first athlete in the county to be invited up to the Nike Cross Country Nationals where he finished 25th place against some of the absolute best in the nation! And yes - he's only a junior! What a journey and arguably THE greatest season in Riverside County history! We cannot to see how much he improves upon his 4:26 / 9:34 credentials this upcoming Spring! 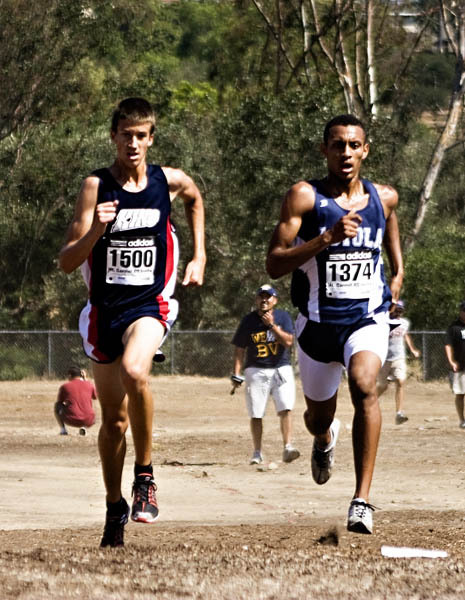 Congratulations to our 2009 Boys' Riverside County Athlete of the Year - Martin Luther King's Lane Werley!